Two second-half goals from David Cushley helped champions Crusaders to a 4-2 victory over Coleraine at Seaview. 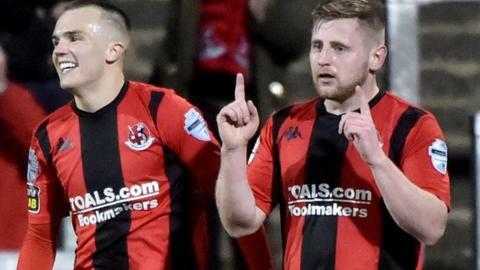 The victory takes the third-placed Crues to within three points of Ballymena United in second. At Stangmore Park, meanwhile, Dungannon Swifts produced a superb comeback to overturn a 3-1 deficit and beat Warrenpoint Town 4-3. Basement side Ards suffered their seventh defeat in a row as they lost 3-0 at home to Institute. Colin Nixon's side remain three points behind Newry City in 11th and 14 points adrift of 10th-placed Warrenpoint, who have played a game less than than Ards. A stunning curler from Cushley was the highlight of the match at Seaview, where the north Belfast outfit punished the visitors for a series of missed chances by taking the lead through captain Colin Coates on the stroke of half-time. Cushley doubled the margin with his curler and extended it to 3-0 with a header before Dylan King pulled a goal back for the Bannsiders. A Jamie McGonigle penalty put the pressure on the hosts before Ronan Hale struck late to seal the win. At Stangmore, Warrenpoint dominated the opening hour at Milltown and led through early goals from Danny Wallace and Mark Griffin. Mark Patton pulled one back for the hosts before the break but they soon found themselves two down again after Deane Watters turned in Philip Donnelly's low cross. Kris Lindsay's side again responded well and drew level after a Hernany Marques own goal and a brave finish by the excellent Daniel Hughes. Patton scored the winner with 10 minutes remaining to make it five wins from seven league outings for the Swifts, while Point finished with 10-men following Anto Reilly's late dismissal after receiving two yellow cards. The win takes Dungannon above Glentoran into seventh in the table. Ards' hopes of avoiding relegation suffered another blow as they rarely looked like scoring at Clandeboye against Stute, who also climb past Glentoran and into eighth..
Skipper Dean Curry opened the scoring when he slid a low first-half strike into the bottom corner past keeper Sam Johnston, who got a touch on the ball but couldn't keep it out. Substitute Jake Morrow doubled lead with a left-foot thunderbolt from 25 yards, with Ronan Doherty making sure of the win with a well-placed curler late on.